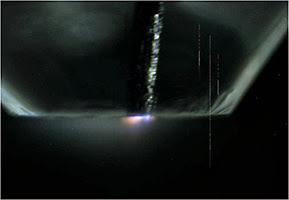 Within the last fifteen years, low-temperature, atmospheric-pressure air plasma has been shown to have toxic effects against a variety of bacteria and other microorganisms. We study the application of air plasma as a means of disinfecting surfaces and liquids. Currently, we are working to understand the relationship among plasma processing parameters, plasma chemistry, and microbial killing; we also aim to elucidate the biochemical and genetic effects of plasma treatment. 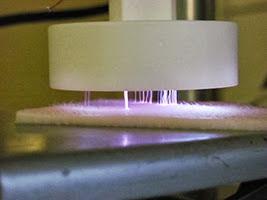 An eventual goal of the project is to develop a low-cost, portable plasma sterilizer suitable for use in the developing world or emergency medicine. In collaboration with Prof. Douglas Clark, UC Berkeley Department of Chemical and Biomolecular Engineering. Increased levels of reactive oxygen species (ROS) are a hallmark of many types of cancers. This is thought to promote cancer mutation and adaptation to treatment strategies. Many promising new therapies seek to introduce additional ROS into cancer cells, pushing them over the limit into senescence and cell death while normal cells, with lower ROS levels, are unaffected. Plasmas are a promising source of ROS for this purpose. We seek to evaluate the effect of plasma treatment on cancerous and normal cells and to investigate the molecular mechanisms responsible for the differential effects. In collaboration with Prof. Douglas Clark, UC Berkeley Department of Chemical and Biomolecular Engineering. High-energy photons at specific wavelengths can interact with plasma-generated species to create biologically relevant reactive species. We study the chemistry and antibacterial effects of combined plasma-photon treatments. In collaboration with Profs. Gary Eden and Sung-Jin Park, University of Illinois. In plasma medicine, the therapeutic activity of plasma treatment is generally attributed to the generation and delivery of reactive oxygen and nitrogen species (RONS). However, the interaction of plasma-generated species with biomolecules remains poorly understodd. 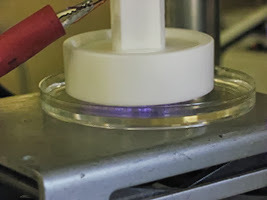 We study the interactions of ambient-temperature plasma with aqueous solutions and simple biomolecules to better understand what modifications to these species occur. 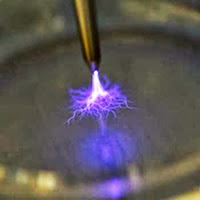 This knowledge will help us to tailor plasma devices for more effective treatment. In collaboration with Dr. Volker Schulz-von der Gathen, Ruhr-Universitaet Bochum. In collaboration with Prof. Gregor Morfill, UC Berkeley Department of Chemical and Biomolecular Engineering. 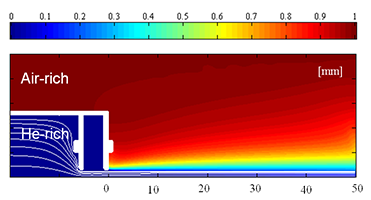 A fast 2D hybrid fluid-analytical TCP reactor model was developed using the finite elements simulation tool COMSOL. A gas flow model solves for the steady-state pressure, temperature and velocities of neutral species. By varying the reactor parameters, we can observe their effect on plasma characteristics such as density, uniformity, capacitive coupling and the E to H transition. We would like to extend the model by adding more gases (currently, Ar/O2/Cl2), a matching network circuit, and multi-frequency sheaths. We would also like to couple the fluid-analytical code to particle codes to obtain the ion energy and angular distributions at the wafer. In collaboration with Prof. Mike Lieberman, UC Berkeley Department of Electrical Engineering and Computer Science.